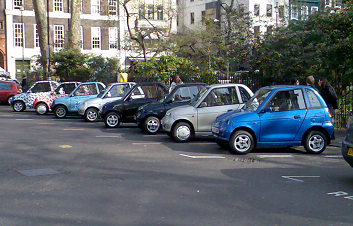 The G-Wiz electric city car is not quite as common as the attached photo would have you believe - this sight, eight G-Wizs parked in a line this morning in London's Soho Square, was presumably some sort of marketing stunt. Nonetheless, the cramped plastic runabouts are seen increasingly commonly, pootling along amid the aggressively steered BMWs, U-turning taxis and incredibly long buses that seem to make up the rest of the capital's traffic. But the line-up does raise a question. Where are the rivals? Yes there are other electric cars on the market, but even in Congestion-Charge afflicted London, they don't seem to be selling. We simply never see them out on the roads. Why not? Actually, the above also raises another question. What actually is the plural of G-Wiz?